Spectacular views and state-of-the-art interactive experiences greet visitors to Segal Visitors Center. Completed in 2014, the striking, modern building is the perfect start for a campus visit. Located at 1841 Sheridan Road in Evanston, the Segal Visitors Center is open weekdays from 8:30 am to 5 pm. See the university's culture and accomplishments come to life. A unique configuration of monitors features a video introducing you to Northwestern's groundbreaking discoveries and campus traditions. 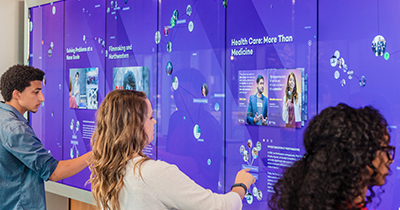 Use our touch-screen wall to select, move and view more than 150 interconnected stories about Northwestern's student opportunities, alumni, faculty and research. Where do our alumni go after graduation? The possibilities are endless. 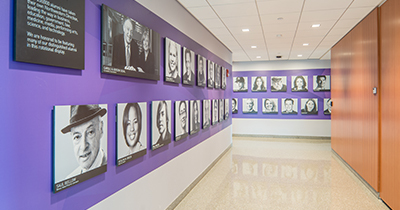 Take a walk down our hall of alumni portraits to see some of the notable alumni who got their start at Northwestern. The 160-auditorium features floor-to-ceiling windows that showcase an eastern view of Lake Michigan. Here, prospective students can participate in an undergraduate admissions information session. The Segal Visitors Center plays an important role welcoming prospective students and their families. Undergraduate Admissions provides campus tours, which depart from the Visitors Center, as well as information sessions. Register now on the Undergraduate Admissions website. Designed by architects Perkins & Will, the Segal Visitors Center brings together a modern aesthetic, sustainable features and usable spaces. The glass and stone structure stands at the southeast end of campus, situated along the coast of Lake Michigan. The Center includes an auditorium, meeting rooms, offices for admissions staff, a two-story reception area and a parking garage. The Visitors Center includes a parking garage with capacity for more than 400 cars. Learn more about the garage and parking at Northwestern. The Segal Visitors Center is named for alumni Gordon and Carole Segal. Gordon and Carole Segal met at Northwestern, graduating in 1960 with bachelor's degrees in business and English, respectively. 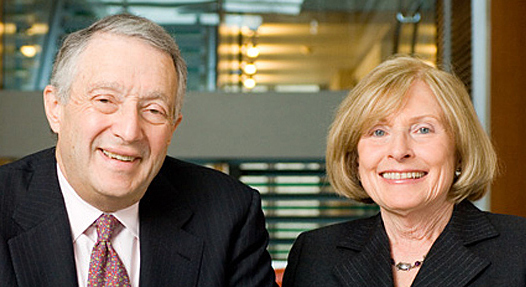 The couple co-founded Crate & Barrel in 1962. Gordon Segal retired as CEO in 2008 and serves on the Northwestern University Board of Trustees. Carole Browe Segal is also a former CEO of Foodstuffs Inc. In addition to serving on the Board of Visitors of the Weinberg College of Arts and Sciences, she acted as president of the Northwestern Women's Board and received the Alumni Medal in 2008. 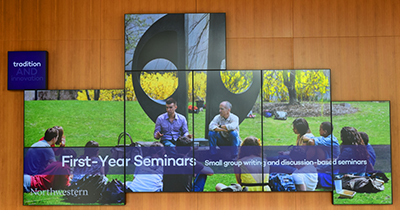 Since 1986, Segals have given annually to Northwestern, and a substantial gift in 2007 established the Segal Design Institute at the McCormick School of Engineering and Kellogg School of Management.